Our first ever singing residential weekend is set to take place later this year, more details below. Following the successful end to the Spring term with vocal workshops, 2018 was quite a year for the individual vocal students of iwant2sing, the Me-Time Pop Choir and collectively the lot of them as they sparkled their way through fantastic performances at this year’s Summer Singer’s Showcase. Many people, particularly choir members took to the stage as soloists for the first time, others built their confidence on last year’s debut and a few seasoned performers and longtime students dazzled the audience with their outstanding performance and vocal abilities. As their vocal coach and biggest fan I think I loved most seeing such an array of singers, abilities and experience all taking to the stage with full support and appreciation of one another – it was a wonderful night. 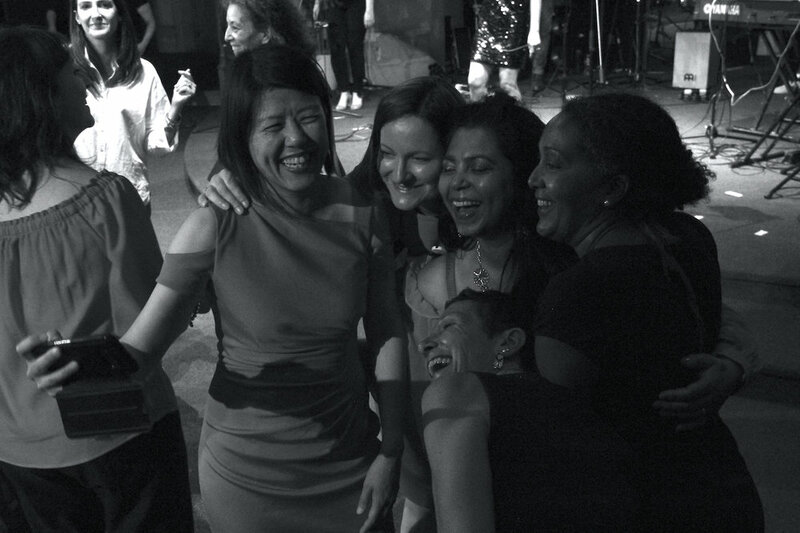 We were again privileged to have some of London’s best session musicians in the house band and performers and audience alike really let their hair down for the party-set at the end of the night, lead by myself and the band. I already can’t wait for this year’s event. See the story of the night in pictures below. The Autumn/Winter term 2018 of MTPC hit it off with an influx of new faces and some fantastic songs to be learned in prep for performances during the Christmas season. All 5 performances we were booked for were very different and special in their own way. Highlights were singing at Dalemead Residential Home and seeing some of the lovely residents with dementia responding to our singing and joining in, helping raise cash for Care International singing in Paddington Station, and performing up on the balcony in Ealing’s new restaurant, ‘No:17’, while the Christmas Tree lights in Elizabeth Square were turned on. We also had so much fun singing for Light up the Lane, Pitshanger Lane’s Christmas lights event and at St Paul’s Church’s Pub Carols event. See pictures below. Christmas Tree Lights switch on at Elizabeth Square, Ealing. Light up the Lane - Pitshanger Lane, Ealing. Bring it on 2019! - This year holds even more exciting opportunities. The ME TIME POP CHOIR Spring term 2019 will culminate in a fun, interactive vocal workshop with Nicki Currie of Milton Keynes Women’s Choir. As well as offering her vocal and choir leading skills to us, this will be a chance to meet Nicki ahead of the next exciting event planned for the choir in June – our first ever choir residential. 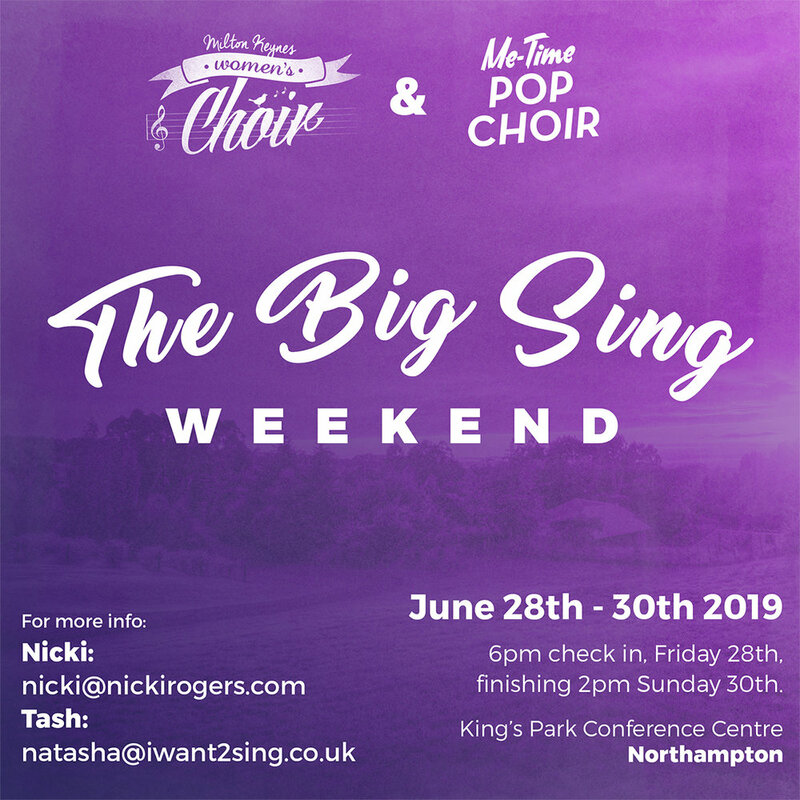 The Big Sing weekend sees us collaborating with Nicki’s Milton Keynes Women’s Choir and will be held in the last week of June at Kings Park Conference Centre in Northampton (see E-flyer below). We are literally so excited about this weekend that is going to unleash a whole heap of fun, song and social time. Although we’ll be collecting deposits on 15th February, late comers are welcome, so do get in touch if you are interested in attending the residential at a later date. Fun, friendship and funky tunes! Join us on a Wednesday night 8:30pm-10pm, £7.50 pay as you go. 2pm - 3pm = Beginners Vocal Technique, at St Paul's Main Hall, Ridley Avenue (opposite St Paul’s church main entrance), Ealing, W5. This workshop is for anyone who is interested in singing and learning a bit of vocal technique in a group setting. If you’ve never had a singing lesson before but would love to try one this is the workshop for you. Entry fee to this workshop includes entry to the intermediate workshop, which follows straight after. Emailnatasha@iwant2sing.co.uk to sign up or you can buy your ticket online below. Not only did several students begin working on Rock School Performance grades ranging from Grade 2 - 6, Natasha again vocal coached on ITV's The Voice UK casting tour following doing the same in 2016 for The Voice UK and Voice Kids. 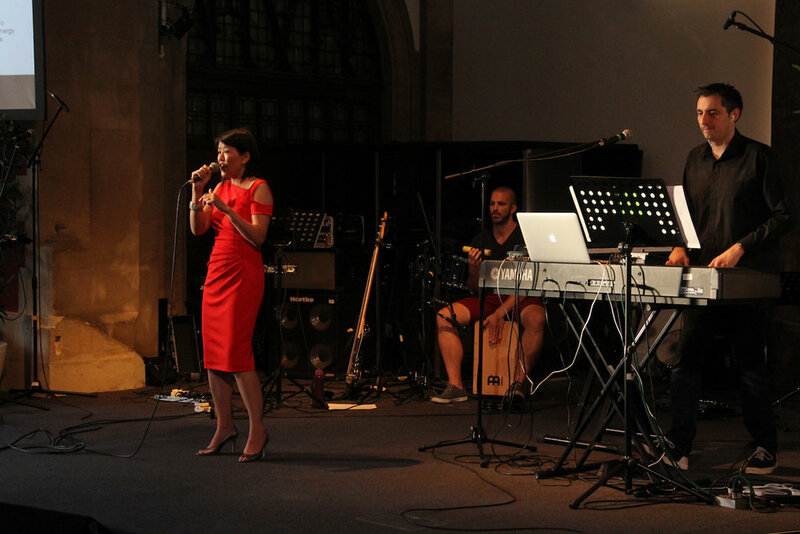 In the Summer the much anticipated Singer's Showcase which took place on Friday 23rd June proved to be an amazing night of good music and achievements. The Me-Time Pop Choir , plus several debut soloists from choir members and iwant2sing Singing Students did themselves proud and headlining Singer/Song-Writer Merfy went down a storm, not to mention our live band of top musicians. I'd like to give big thanks and full credit to Laura Ridley who saw to it that the Me-Time Pop Choir continued to run smoothly throughout the remainder of the year during my maternity leave. She helped lead the choir to deliver three successful Christmas performances locally in Ealing and also to take part in an event to raise money for charity Help Musicians UK in Central London. Laura (on the far right), did a fantastic job covering Natasha whilst on Maternity Leave. Many more exciting plans are under foot for the rest of this year with Natasha returning to coaching, students taking Rock School exams, another Singer's Showcase in the Summer and several other public performances for the Me-Time Pop Choir, watch this space! Following a break last year I'm excited to announce the annual I want 2 sing - Singer's Showcase will take place on Friday 23rd June 2017. Several hard-working singing students get to showcase their talent, as well as performances from the marvellous 'Me-Time Pop Choir' and main act, 'Merfy'. Bring your own Wine and Beer. I'll be running a beginners workshop on Saturday 16th July, 10am - 1pm, at St Paul's Main Hall, Ridley Avenue (opposite St Paul’s church main entrance), Ealing, W5. This workshop is for anyone who is interested in Singing and learning a bit of vocal technique, how to understand and improve the voice & pick up some performance skills too in a group setting. If you’ve never had a singing lesson before but would love to try one this is the workshop for you. Emailnatasha@iwant2sing.co.uk to sign up or you can buy your ticket online. It's that time of year again when some of my hard-working singing students get to Showcase their talent at the annual I want 2 sing - Singing Lessons Singer's Showcase 2015. By popular demand we are back at the lovely intimate St Paul's Church in Ealing with its fantastic acoustics. In addition to the soloists we are proud to have the Mum Me-Time Pop Choir & Me-Time Pop Choir with us for their debut performance and there will also be a special guest headlining act. Put it in the diary and tell your friends - it's going to be a fab night of good music. Subject: 'iwant2sing showcase tickets 2015' with number of tickets required. After payment you will be emailed confirmation containing a unique serial number, please bring printed or electronic confirmation on the day. iwant2sing are proud to present a Vocal Master-class featuring the outstanding vocal talents of JP Cooper followed by an evening LIVE PERFORMANCE from the man himself + Special Guests. Singers, Musicians, Teachers, Music students, Music Lovers, come along to pick up some tips from one of the best upcoming artists and vocal talents in the UK right now. I have been privileged enough to be doing some backing singing for JP at some of his live gigs over the past 6 months and was thrilled when he said he would come along to take part in our next big Vocal Workshop day. I will be offering tuition, demos & practical singing help using the songs and voice of the fantastic JP Cooper. And to top it all off you can stick around to see him perform a full set of his own material in the evening following some special guest support-acts. The evening Gig offers a great chance to see JP Cooper live following his tour supporting Angie Stone this month, so if you missed him there, catch him here! The gig is open to the public, even if you are not attending the Vocal Workshop. This is an event not to be missed. No previous singing experience is necessary and the workshop will largely be a spectators event only involving ‘willing’ volunteers. There are limited spaces on the Master-class so book now to avoid disappointment. Special price available for Workshop plus Gig. For Tickets, Email natasha@iwant2sing.co.uk Subject: Gig Only, Gig + Masterclass or Masterclass Only with number of tickets required. After payment you will be emailed confirmation containing a unique serial number, please bring printed or electronic confirmation on the day. NB: Please note you do not have to attend the Vocal Workshop in the afternoon in order to attend the evening performance, it is a public gig. Each year the Singer's Showcase is a big hit with iwant2sing students and family & friends alike, this year promises to be no different. This year's theme is an 'Acoustic Night' where singers will perform a variety of their own original music as well as some well known singer/song-writer classics all backed up by a fab, stripped-down acoustic band. I have chosen a new, atmospheric and intimate venue for this year's showcase within the walls of St Paul's church in Ealing. And to top it all off, this year has 2 special guest main acts performing in the 2nd half. Sugarfoot is my own band who I have been writing & performing with for around 8yrs. As well as the usual live band circuit, we have recorded two EP's and toured with 'Take That' as their support act. I'm hoping our cool, soulful sounds will be taking the audience to a place of good vibes. The second guest performer is former student Savannah Dumetz. This 17 year old young lady oozes talent. She started writing songs soon after she started vocal lessons with myself at the tender age of 13. Her singing voice, performance skills and song-writing have soared from strength to strength since then as you will see when she performs some of her latest material for us. She's definitely one to watch. All this for just £7! Come join us for what promises to be a great night of fun & music. You can order tickets directly from me by emailing natasha@iwant2sing.co.uk or through any performing student. Find out how Tolu Salako got on when she took her grade 7 and 8 Rock School exams. How did you first hear about the Rock School Vocal Exams? I remember looking it up 2 years ago, but I didn't have the confidence to do it. Tash encouraged me to have a go. How long have you been having voice lessons with Natasha? Well, now that I think of it, its been 4 years. Why do you think RS vocal exams are a good idea? Rock School exams, especially the performance certificate is a brilliant idea, because the examiners give you constructive criticisms rather than "Wow you have an amazing voice!" They are examiners who are so interested in you as a performer that they give you their undivided attention. You dont just get your grades back, but they provide you with an examination report that describes what they observed from your technique and performance. How did you know what Grade to go for and which songs to choose? I spoke to Tash about it, cause she was the best person to speak to. When I was told that I could easily excel in grade 7, I almost thought Tash was having a laugh. I guess she knew what she was saying as I gained a distinction! :-) In choosing the songs, I decided to go with songs that I could perform, and not just sing, cause once I am able to get into the character of a song, everything falls into place & at the higher levels they are looking for performance AND vocal skills. How easy was it to apply for the examination? Applying for the exam is a straightforward process. You could either apply online or via post but the online application is quicker. They give you a call 2-3 weeks after your application to discuss which date is the most convenient for you. How long did you study for the Grade before taking the exam? I started working on my songs for both grade 7 and 8 the same week I received a call from them to confirm my exam date which is usually a month or two before the exam. This time was enough for me to work on the lyrics and think through my performance but the good thing about Rock School is that you can take as long as you need to work on the songs and then just apply for the exam when you're ready. Do you think the exam fees are reasonable? Yeah definitely, it is money well spent. What was the examination like? And what was the examiner(s) like? When I arrived at the venue, I was provided with a room to warm up in for 30 minutes, this helped to calm my nerves in preparation for the exam. The examiner, just one, was very friendly and professional and it looked like he was enjoying himself. Can I say how encouraged I was to see that, especially since it was an audience of one. This made me enjoy myself even more. How long did it take for you to get your result and were you happy with the result? It usually takes about 2-3 weeks to get a response. I was over-excited about my grade 7 result because I knew the amount of effort Tash and I had put into preparing for it. For my grade 8 result, I was even more excited because even Tash would agree that I was anxious and insecure about the songs I chose. Have you used the Rock School accreditation to gain access to any further opportunity, job or education? I'm currently on a Vocal Masters Degree Course at The Institute Of Contemporary Music Performance so yeah. I had to audition and provide other evidence of my ability. Rock School gives you the support and qualification you need for a lot of music further education. Would you recommend the experience of studying for a Rock School exam? I wholeheartedly recommend Rock School Vocal exams. It can be a challenge learning 5 songs, but a vocal teacher like Tash gives you plenty of support and good coaching - You'll be fine. Who knew fun and examinations could co-exist! TOLU GAINED A DISTINCTION PASS IN BOTH HER GRADE 7 & GRADE 8 ROCK SCHOOL VOCALS EXAMS.